This feature can be used in Enterprise and Premium plans. Open this article on details on how to upgrade. This feature is available only to workspace administrators. 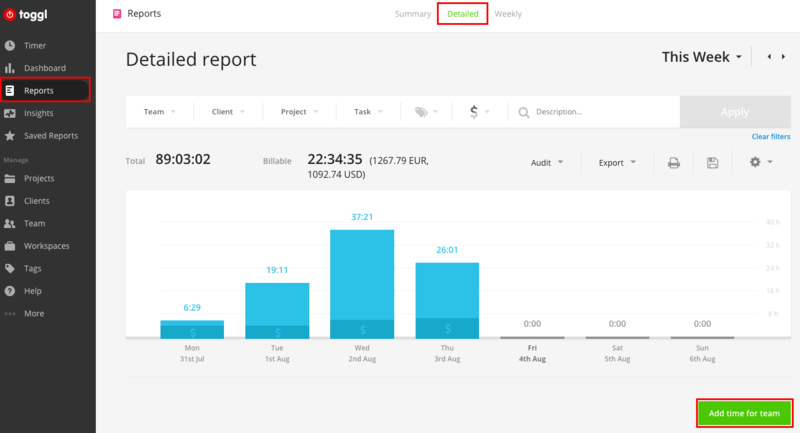 They can add time for their team members from Detailed Reports page. Close the modal by clicking on the blue Close button on the bottom right. If you want to change the User on an existing time entry, click on the User’s name in the list and select a different one. Please note that workspace administrators cannot add (or edit) time entries within private projects in which the workspace administrator is not a member.